The Oath of Nerull marks the third novel from the T.H. Lain line that accompanied Third Edition Dungeons and Dragons into the world and it is my favorite so far. The novel follows the adventures of Ember the monk, Berk Gorunn the cleric of Moradin, Hennet the sorcerer, and Nebin the wizard as they attempt to save Ember's monastic order from the vile machinations of the servants of Nerull. The pacing of the story is well balanced as it begins with an ambush in a back alley and steadily pushes towards an ending that came all too quickly. Most of the novels associated with the Dungeons & Dragons line that I have read over the years are notable only for their staggered phrasing and unremarkable plot lines. They suffer from being too predictable and from trying too hard to illustrate game mechanics in novel that should be focused on the story. By and large Oath of Nerull manages to avoid those problems by focusing more on the characters and far less on the mechanics of the game. Even if the characters had been nothing more than wooden stand-ins, barely noticeable and wholly unremarkable, the book would still be an great read for four events within its pages. The first I touched on in a post earlier this week, The Effects of Consorting with Beasts and Saying Terrible Things to the Wrong People, when I discussed the idea of magical spells having a deeper effect on a mage than just the expenditure of power. The second event came in how the Cult of Nerull was compelling Ember's monastic order, The Enabled Hand, which I won't spoil. Next came Nebin's explanation for the ruins they explored underground (pg. 134) which was dismissed by his companions as a flight of fancy but struck me as one of the most brilliant little turns in the book. The final event was the riddle of Lo-Riao (pg 139 - 140) which had to be solved in order for the group to free themselves from an ancient testing chamber and actually made me like riddles for the first time in my life. 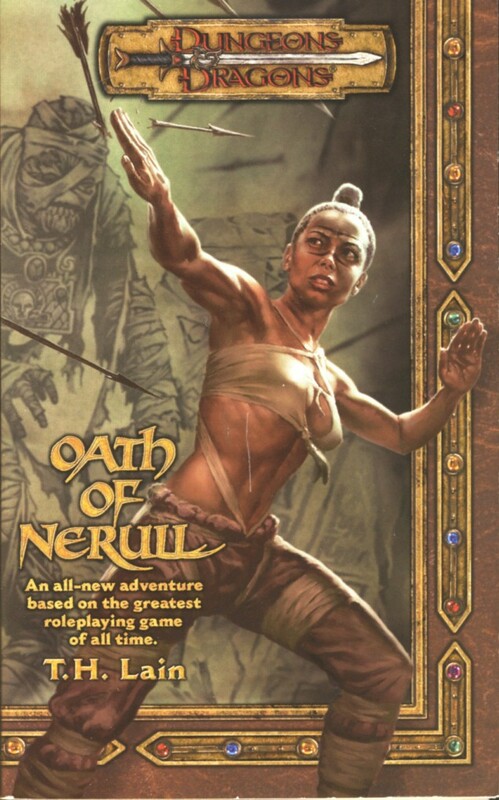 When I began the Oath of Nerull I was worried that it would be another in the long line of disappointing fantasy novels that I've read in the last few years as it started down the same path plodding well worn territory. Happily it turned out to be one of the best novels I've read from the Dungeons & Dragons line and a fine addition to my library. If you've been hesitating on trying a book from Wizards of the Coast this is a great one to attempt as it's short, coming in at only a 180 pages, and cleverly written. I've read a few of these novels, and I recall enjoying them as light, quick reads. Regardless of the quality of the plots and characters, they all seem to capture the essence of D&D fairly well, which was their primary purpose. These were marketing tools. 200-pages of ad copy, disguised as Fantasy Adventure. So, I kind of give them some slack. That being said, I now want to read this one, because it was one of the few I hadn't got to yet. Is it set in any particular campaign world? The starting city is named Volanth which has a Forgotten Realms connection but the Kingdom of Soes, and New Koratia (their destination city) are not connected to any particular setting that I have been able to find. While its possible that they're supposed to be set in either the western portion of the Flanaess or on another continent in the setting it's far more probable that it's actually just a generic stand-in.